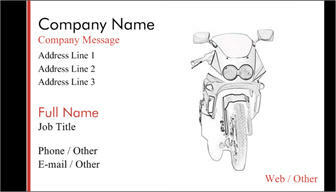 Ideas For Motorcycle Business Cards! If you want motorcycle business cards for your home motorcycle business, professional motorcycle dealership, or fabrication shop, here are some tips to help you get the right card to help you build your bike business. Side Bar: Highly Recommended -- This business card source is perfect for small and large orders at very low prices (up to 80% off!). With smart phones taking over the world business cards will be scanned into the phones and then tossed so that your contact information is loaded into the phone. But you do need to have motorcycle business cards on hand to show that you are a professional, and you will get a call once in a while from someone who got your card somehow (but don't rely on it). Or you can upload your logo or picture of one of your bikes and simply put your contact information in! If you are dead set on designing a killer motorcycle business card then I recommend going all out and making it stand out from the crowd, almost forcing your prospect to hold on to it and show it to people. Get odd shaped business cards. Maybe the shape of your top bike. Get a plastic version of your business card. Get a foldable business card that requires it to open up like a book. Use money as your eye catcher, folded up, so that it forces people to see it and then open it up to read your sales message and see your contact information. Attached an eye grabber or a 'grabber' to your business card. Maybe a tiny helmet, handlebar grip, foot peg, logo. Create a pop out cut out of a motorcycle. 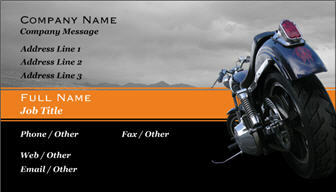 You client or customer simply pops out the motorcycle which has all your contact information. Use your imagination and your motorcycle business cards can come to life. This might hurt a little bit, but the fact is, a business card is not the driving force behind earning new business or sales opportunities. Sure, you need them to hand out and hope to get a call or have them passed around, but the truth is, they get tossed. Don't spend a lot of time on a motorcycle or chopper business card design because your valuable time should be spent on marketing your motorcycle business and getting new customers in the door. 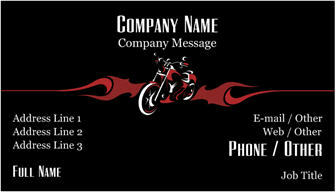 The message here is that you should spend very limited time on your motorcycle business cards and order simple design here now﻿, or if you are going to spend time on it make it really different and unusual so that it has the best change to bring you business.